"...The west coast premiere of playwright Laura Maria Censabella's PARADISE receives a strong mounting at the Odyssey Theatre, blessed with the sturdy acting chops of Medalion Rahimi and Jeff Marlow in this singular two-hander. Vicangelo Bulluck ably directs this important, not-oft-told story of a Muslim girl having to weigh her options of family obligations vs. personal goals. Aspects of her Muslim culture take centerstage with the problematic misfortunes of her biology professor, Dr. Royston, a disgraced scientific genius, now downgraded to teaching in an inner-city Bronx high school." "...Jeff Rowlings’ set and lighting and Jon Gottlieb’s sound are effective. Mylette Nora’s costumes are carefully considered – even if the audience never gets to see Rahimi’s hair, tucked as it is inside a hijab. Executive producers Viola Davis, Julius Tennon, and John Cappetta have a wonderfully complex tale to present. 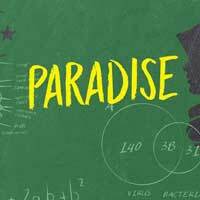 PARADISE proves to be entertaining, thought-provoking, and fun besides. This is a fascinating study of conflict and how it might be resolved – or not." "...A Columbia University professor reduced to teaching science in an overcrowded, underfunded Bronx high school and a Muslim-American student with dreams far loftier than her Yemeni immigrant family are likely ever to allow. From these two disparate, desperate souls, Laura Maria Censabella has written Paradise, as intelligent, thought-provoking, compelling, heartbreaking, and satisfying a two-hander as I've seen in a good long while." "...Finally, anyone familiar with the 1980 Willy Russell play (and 1983 movie) Educating Rita cannot help but see some worrisome parallels here. If you replace the 27-year-old British hairstylist with a 17-year-old Muslim-American girl, you basically get Paradise. It's the same story of a young woman finding herself while the burned-out man finds a different kind of redemption. Anyone else have a problem with that?"